Run + Done = Happy. I ran the Portland Marathon harder and faster than any marathon I’ve done before. This was my thirteenth marathon, and I wanted a personal best for lots of reasons, the biggest of which was that I wanted to associate Portland with something really positive. And now I do. I haven’t been able to pull up my official results yet, but my watch time was 4 hours and 53 minutes. This is the first time ever that my marathon time started with a four. My previous best was a 5:12, which happened in New York in 2010. My best this year, before today, was a 5:19, which I did in Barcelona. So 4:53? I’m thrilled. Even better than my time was all the stuff that happened in my head as I ran. I’ve said before that training is one way of dealing with my own demons and that my physical and emotional well-being are closely linked. This year, I’ve been dealing with more demons than usual, and if my physical improvement and performance are an indicator of anything, my emotional well-being is on the mend. In this race, I never hit a wall. For the first ten miles, I was just in awe of what I was seeing on my watch. Most of my one-mile splits seemed to start with a 10, rather than an 11 or a 12, which is huge for me. For the next ten, I was fighting like hell to keep up the pace, which I know faded, but I don’t believe it ever faded to a 12. I’ll have to check my splits, but I think they were mostly 11s once I slowed. I forced myself, at mile 16 and 17, to run up and over the St. John’s bridge when everyone around me was walking. That was huge for my head. I realized then that I would hit a personal best today. It was no longer a question of whether, but of by how much? And once I hit mile 20, I heard myself think, “I can do a 10K no problem.” And I kept going. The physical part was hard, but the mental part felt…effortless. I had expected to battle with emotions all day today because my heart still feels broken, and I associate so much of the brokenness with this place, but the tears didn’t come until I approached the finish line. And those I am sure were happy tears. I just felt well today. I was expecting to hurt. I was expecting to be overtaken by sadness at times, but that just didn’t happen. I think a big part of my being okay came from the company I kept yesterday. My friend Gretchen, who lives in Washington, drove down to spend the day with me. We met at Whidbey Island last November. While she was here, we did something I was hoping to do – we walked up to the top of Mt. Tabor Park and took pictures. 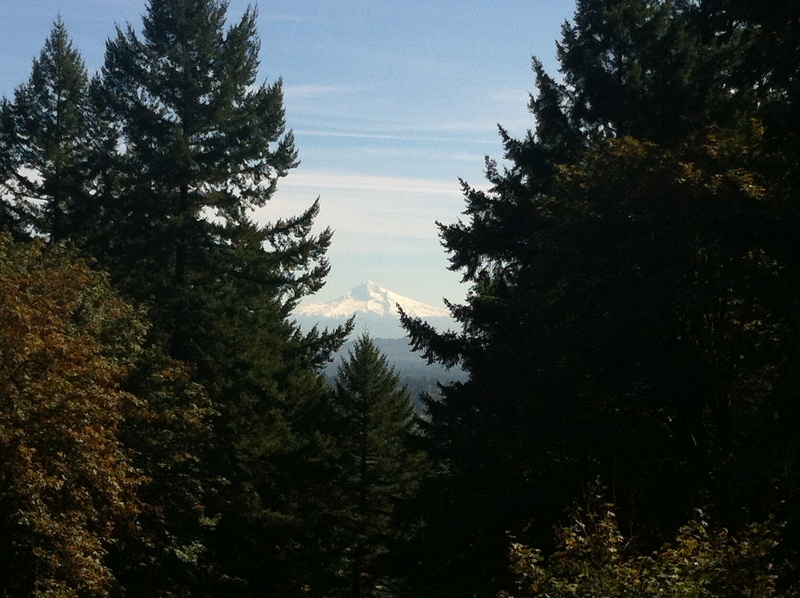 We took pictures of the view of Portland, and as we were walking back down, Gretchen spotted a view of Mt. Hood that I would have missed had she not been there telling me to look. Gorgeous, no? We also spent some time at a cute little fabric store in the Alberta Arts District and ate lunch at a nearby Thai place. We even pulled into the train station to explore the inside because we were so charmed by the station’s exterior. Gretchen gave me new and wonderful memories of Portland. That’s what I needed yesterday. I needed to be in this place in the company of a trusted friend. Thank you, Gretchen. I’m so grateful that you went out of your way to come here and gifted me with your time. You did my heart good yesterday, which made both yesterday and today incredibly special. This entry was posted in Friendship, Race Report, Running. Bookmark the permalink. Woot! So happy for you to have happy memories of a place and a time that had so much potential. May it be a sign of other wonderful things to come! here its said, from strength to strength, physical, emotional and any other you wish for.